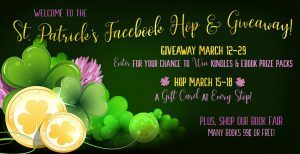 Enter the St. Patrick’s Day Romance Giveaway with Three Different Ways for You to Win Kindles, Ebooks, & Gift Cards Galore! St. Paddy’s Day is coming up and I have three pots of romance reader gold I’m eager to share! I’ve joined forces with 70 other authors to bring you three ways to enter to win almost 80 prizes. 1) Visit our main giveaway and enter for your chance to win one of 7 prizes, including: a Kindle Paperwhite with matching leather case, Kindle Fire, or ebook prize packs where you choose the books on Amazon you want to win! 2) St. Patrick’s Day weekend, March 15-18, join us for an epic Facebook Hop with 70 chances to win a gift card. 3) Enter the BONUS gift card giveaway at our book fair, where you’ll find more than 65 ebooks in a wide range of romance genres to click, buy, and read.